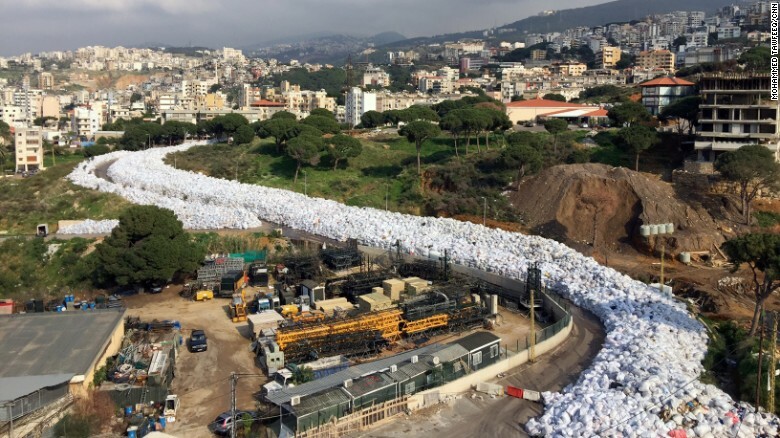 In July 2015, thousands of Lebanese citizens rallied on the streets of Beirut protesting against the government’s inaction over enormous heaps of garbage lying all over the city. Barely a week ago, the government had shut the Naameh landfill, that served most of Beirut, because it had outrun its capacity. The city’s garbage collection company just stopped collecting trash two days after Naameh’s closure, saying its own dumps were full. The authorities did not have a backup plan. Trash began to pile up everywhere, rotting in the summer sun. For several months, protesters and police violently clashed in the capital city in one of the biggest shows of civil disobedience in Lebanon in 10 years. This came to be known as the “You Stink” protest movement. These continuous protests reflect the public frustration at the incompetence of the government to make civic decisions from the time the presidency was vacated in 2014. Appointments, planning approvals and budgets remained frozen, while political camps feuded over who should take the top job. In February 2016, CNN reported an image of a river of stinking garbage bags that snaked its way through Jeddah, a suburbs of Beirut, a consequence of the still pending and an almost year-long garbage crisis – and a symbol and a byproduct of the country’s dysfunctional politics. 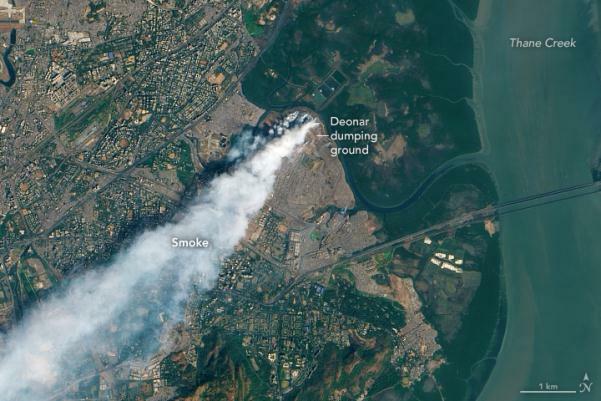 Around 4000 kilometers to the East, the city of Bombay or Mumbai (renamed to its original name as a protest against British colonial rule) has been in the news for a spate of fires and subsequent toxic fumes rising from its oldest and largest landfill at Deonar. In 2016, the landfill caught fire four times in the two months of January and February, and each time the fire raged for a couple of days to more than a week, creating a thick blanket of smoke and dangerously increasing the levels of hazardous particulate matter in the city’s air. These garbage fires were so massive that they were visible in space and recorded by NASA. The World Health Organization recommends PM2.5 (ultra-fine particles that damage respiration) exposure of no more than 25 micrograms per cubic meter over 24 hours. In the days of the Deonar fire, Mumbai’s recorded PM2.5 levels of 333, more than ten times the permissible limit. Local residents that inhabit slums near the landfill complain that fires, polluted air and accompanying respiratory ailments have become a common occurrence. A major fire had broken out at the landfill in February 2015 as well. The latest blaze in March 2016 claimed its youngest victim when a seven month-old baby died after his pneumonia worsened because of the smoke from the fire. The residents of Beirut took to the streets to protest the piling garbage across their city. The residents of Mumbai also came out on the streets, but, for an entirely different reason altogether. Two days after the first major fire broke in January 2016, citizens of the municipality of Chembur, which is barely a couple of kilometres away from the Deonar landfill, inaugurated a 12 day sports and cultural festival attended by thousands. This festival had citizens of all age groups running 5 kms in a mini marathon and youth teams competing for trophies in cricket, kabaddi and basketball in outdoor grounds; citizens participating in yoga, Tai Chi and cooking workshops, and enjoying other Bollywood-themed competitions and live music concerts in open air venues; while the fires were still burning in the nearby Deonar landfill, polluting the Chembur sky. 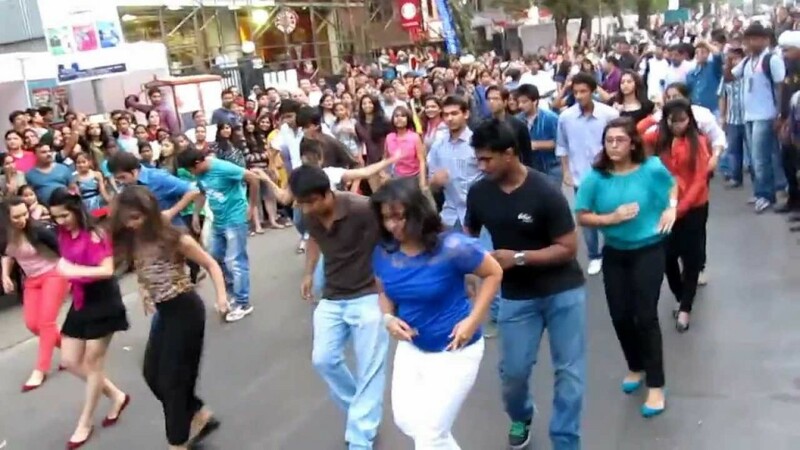 Flash mobs danced on the streets of Chembur while the trash burned two kilometers away. With 12 million residents, Mumbai is more populous than countries like Cuba, Somalia, Greece and Portugal. The coastal city produces 9600 metric tonnes of waste every day, accounting for 6% of the total waste generated in India. Mumbai is a land starved city with two thirds (60%) of its population living in slums. The city uses 3 landfills, prime real estate nearly the size of New York’s Central Park, simply to dump its trash on. The first landfill at Deonar that sits on 326 acres in eastern Mumbai and takes half of the city’s daily waste, was opened up in 1927. 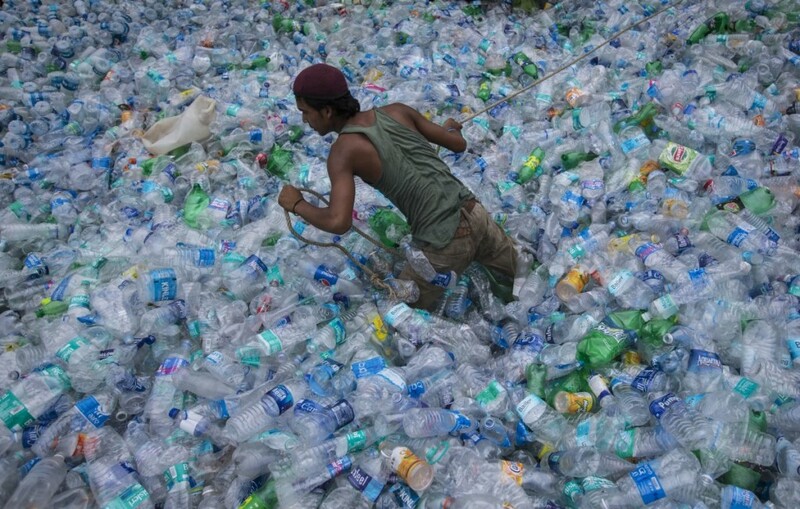 This landfill is also Asia’s biggest and arguably the oldest dumping grounds. 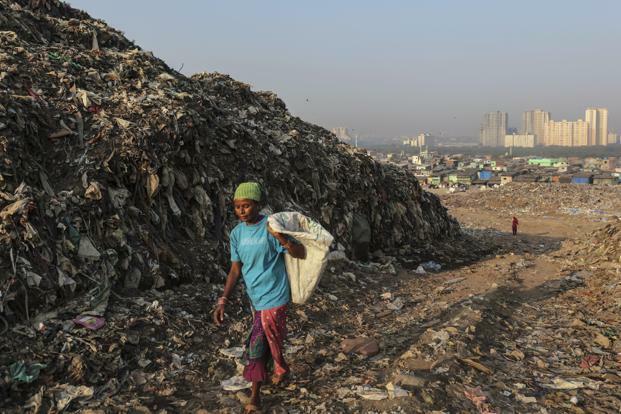 The Deonar landfill currently holds 12 million tonnes of waste so high it could bury the White House – twice over. In 2015, the Bombay high court had ordered for the Deonar landfill to be shut down as it had overrun its saturation point. However it continues to be in use, catching major fires frequently due to the toxic and combustible gases produced as a result of the untreated waste. One of the landfills in northern Mumbai in Gorai active since 1972 was shut down in 2007, as it contaminated the nearby water bodies and led to significant health and environmental damage. Of the remaining 2 active landfills in the city, another one is in the process of being shut down. 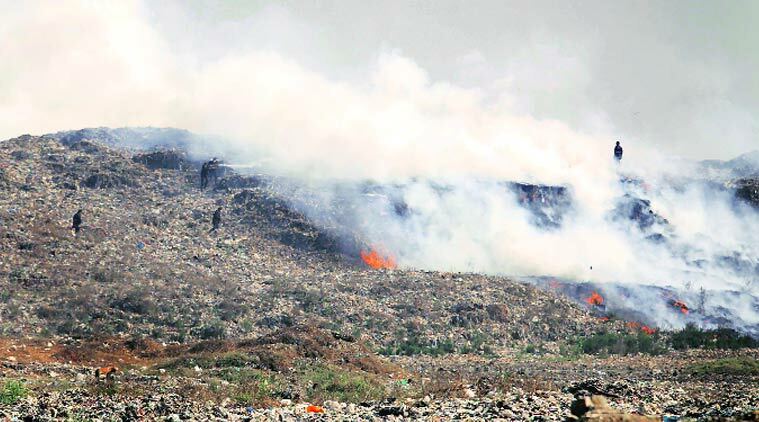 Over 1.4 million litres of water have been used so far to fight the Deonar landfill fires this year, wasting an essential resource at a time when the city is also facing water shortage. Environmentalists are horrified at the routine nature of such fires, given the toxic compounds being burnt. Worse still, nobody quite knows what exactly is being burnt, or what is being released into the atmosphere. These fires have led to the Bombay high court restraining the BrihanMumbai Municipal Corporation (BMC), the local government, from granting permission for new constructions, until it came up with an efficient way to manage the city’s waste. When the first fire broke out, the BMC, which is also the country’s richest local government, promised 10 measures to prevent a re-occurrence. The second fire revealed that the promises were not kept. After the third and most recent fire, the only changes that have been observed are the installation of 12 closed-circuit television (CCTV) cameras on the premises, and initiation of building a boundary wall around the dumping ground. Imagine 12 CCTV cameras for 326 acres – that is one camera for every 27 acres; and while work on the boundary wall is on, it is far from over. While the fires have been a frequent occurrence each year, increasing the incidence of respiratory ailments, morbidity and mortality, the government’s (in)action appears to be more like cosmetic changes. The Deonar fires also bring to fore one of Mumbai’s biggest and looming crisis – its inability to manage its own waste. Despite being one of the most populous urban areas in the world, Mumbai lacks a scientific waste management system. Except for a low capacity biogas plant in 1 of its 3 landfills which treats a rather small amount of waste, the city does nothing but dump its trash in landfills while its sits there untreated, polluting the air and contaminating the soil and ground water. Barring for a few housing societies, most households in Mumbai do not segregate their trash. Around 35,000 BMC staff pick up trash from residential societies and industrial areas every day, making a total of 2000 trips from source to the landfills. It costs the BMC 1.5 million Indian rupees each day in waste collection and transportation costs. What reaches the landfills is a mix of kitchen refuse, plastic, glass, paper, metal, electronic waste and construction debris. Like many other urban areas, Mumbai too, has an informal network of waste pickers, also called rag-pickers, who trawl through toxic landfills, separate waste for recycling and sell it to a chain of scrap dealers across the city. Waste pickers earn anywhere between Rs. 50 to Rs. 100 (75 cents to USS$1.50) per day for the recyclable trash they sell. The BMC has given 1000 waste pickers a license to segregate waste at the landfills, but this arrangement is still haphazard. Scrap dealers then, sell the trash to the informal recycling industry in the city, a large part of which is based in Dharavi, Asia’s biggest slum neighbourhood made popular by the film ‘Slumdog Millionaire’. 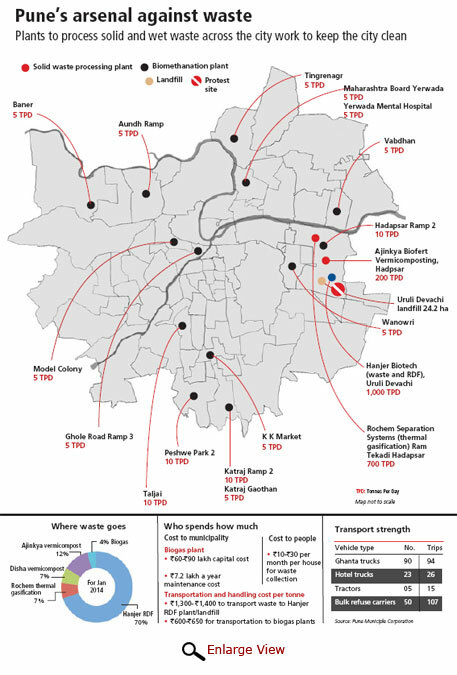 Economists peg the output of Dharavi at an impressive £700m a year. Stree Mukti Sanghatna (which literally translates to Womens Liberation Organization), an NGO set up in Mumbai in 1975, has since organized cooperatives of more than 5000 female waste pickers in the city and trained them in waste segregation, composting, bio-methanation, micro-saving and leadership skills. These women proudly wear uniforms, use safety equipment and earn a livelihood while also saving the BMC huge costs in segregation at source and transport, saving space at the landfills, recovering resources in the form of valuable compost, trying to educate citizens and most importantly, conserving the environment. Sadly, the BMC has failed to integrate this network of trained and efficient waste pickers, and the well-oiled recycling industry, to streamline and improve its own waste management system. While the BMC has been implementing steps in the last few years, none of these have really worked. In 2009, the civic body awarded a Rs. 5000-crore contract to a private firm, United Phosphorus Limited for scientific closure and waste to energy project at Deonar. However the contractor failed to work within deadlines which led to the BMC terminating the contract in 2016. In February 2016, the BMC appointed Tata Consultancy Services, a leading consulting firm to test the feasibility of a waste to energy plant, bring the civic body right back to square one. Such was the political attention and outcry over the fires, that BMC officials were called for an emergency meeting by the Union Ministry of Environment and Forests in the capital city of Delhi last week. The Union Minister has given the BMC one month’s time to come up with a short and long term plan for waste management in the city. The BMC wants to shut down 2 of 3 active landfills, one of which is the Deonar ground. The third, remaining landfill does not have enough capacity to serve the city. Experts say that even if the BMC works round the clock, entirely shutting down the Deonar landfill and installing a waste to energy plant could easily take 3 years. Where does that leave Mumbai’s 9600 metric tonnes of waste generated every day? With no active landfill space or a scientific management system or any other plan in place, rivers of garbage spewing the streets just like in Beirut, could soon become a reality for Mumbaikars. Can Mumbai really turn its garbage crisis around? Well, evidence from countries like Sweden and South Korea tell us that it could be possible. Sweden has made a thriving business out of the country’s waste churning out millions of dollars as profit each year. Almost 99% of Sweden’s trash gets recycled with less than a percent heading for the landfills. In Malmö, the third largest city in Sweden, food waste is converted to fuel that runs 62% of its public buses. Sweden also imports trash from neighbouring countries turning it into heat for its citizens. 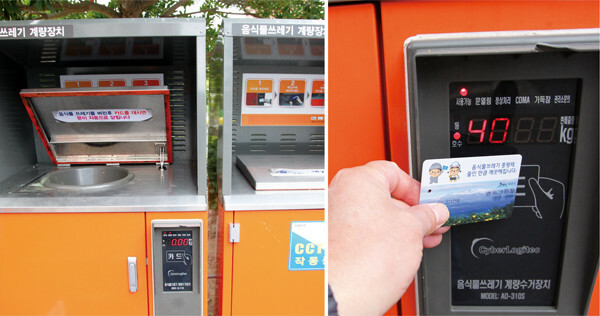 South Korea has piloted a high-tech food waste management program in two of its districts where residents load their food waste into a bin and swipe a card, which gives a numerical reading of the waste’s weight and disposal cost (see image below). Residents are charged based on the amount of food waste they dispose. This new move has already reduced the volume of food waste being disposed by creating a kind of psychological pressure to waste less and hence pay less. Mumbai does not even have to look that far for inspiration to manage its own waste, when its closest neighbors like the cities of Surat and Pune have been lauded for their sustainable models of waste management. Surat a thriving economic city in the neighbouring state of Gujarat is around 283 kms from Mumbai. In 1994, the city was struck by a virulent plague. The epidemic and subsequent deaths led to a clash between the local government and the citizens, while also igniting a collective conscience to manage their waste and keep their city clean. The Surat local government got into immediate action and decentralized the city for waste management. It appointed commissioners for each zone in the city and built in measures for accountability. Housing societies were given a monetary incentive to keep their streets clean. Failure to segregate waste was met a heavy fine. Private contractors were bought in to ensure door to door trash collection. Waste transfer plants were set up across the city, from where waste was finally set to the waste treatment plant located on the outskirts of Surat (see image below), converting it into electricity, fuel and compost. While it took Surat almost a decade to implement this massive city wide waste management system, its citizens are now proud of their clean and disease-free localities. Closer to home, the city of Pune, located around 140 kms from Mumbai, has presented its successful waste management model to several other cities and organizations in the country. 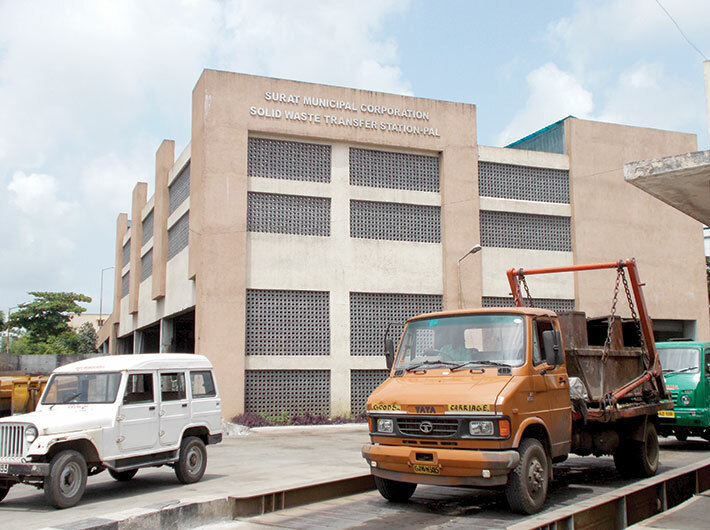 The Pune Municipal Corporation (PMC), the local civic body, has set up public-private partnerships to manage its waste. As seen in the image below, the PMC boasts of biogas plants, centralized and decentralized composting and vermicomposting facilities, a waste recycling plant using refuse-derived fuel (RDF), and a waste-to-electricity plant using thermal gasification technology. While Pune population of 3.5 million generates about 1600 metric tonnes of waste every day, its current daily waste processing capacity is 2100 metric tonnes, which it hopes to expand to meet the future needs of its citizens. The city’s collective effort in garbage segregation and collection is the main reason for its successful waste management. PMC enforces people to segregate dry and solid waste at source. It has also integrated a sizeable number of waste pickers into a formalized door-to-door garbage collection network. In 2008, PMC signed an agreement with SWaCH Seva Sahakari Sanstha Maryadit, a cooperative of waste pickers. SWaCH is short for solid waste collection and handling. Every day, its 2,300 members go house to house and collect 600 tonnes of garbage, 140 tonnes of which is dry. The cooperative covers 400,000 households of the total of 800,000 households in the city, thus two-thirds of the total waste in the city is segregated at source. The PMC also offers a rebate on property tax to residential complexes that take up long term ecofriendly activities such as rain water harvesting, solar heating and vermicomposting. PMC officials conduct monitoring visit to check on defaulting societies. This incentive has been very successful, thus taking care of waste processing at the source. Pune leads the way in terms of an integrated, participatory and scientific waste management system. Mumbai’s waste management crisis needs a systemic change and long-term commitment. This is not a problem that can be solved in a month or three. Rather, it is a deep-rooted civic issue that needs political priority and accountability as well as citizen responsibility in equal measures. Neighboring cities and far off countries offer Mumbai critical lessons in sustainable waste management including segregation at source, integration of the existing, informal and efficient networks of waste pickers and recycling industries, decentralization of waste collection and treatment, use of appropriate and latest technology to process waste and even converting waste management into a revenue generation activity. The national government has approved US$15 billion to develop 100 smart cities and rejuvenate 500 others in the country. Mumbai is one of the cities nominated for this ambitious development plan. But the city cannot move ahead in this direction, if it is unable handle its own waste, leading to increased morbidity and mortality while decreasing productivity and quality of life. Although the residents of Mumbai may not take to the streets to protest waste mis-management like the residents of Beirut, the BMC needs to understand what its people think about waste and how they deal with it. This will help the authorities persuade citizens to act responsibly by utilizing strategic public education, engagement and involvement measures. Rich or poor, Mumbai residents have to be ready to participate and cooperate in managing their waste effectively. The sign of real citizenship is the ability to think about what we do and how that affects our city. Mumbai needs its citizens to voluntarily reduce the waste they produce, sort waste for recycling, keep their own neighborhoods clean, and also act as watchdogs for monitoring initiatives. Mumbai also needs a public-private-citizen movement to manage its own waste and also to survive. However, the civic body needs to first take the issue of waste very seriously by garnering interest and commitment from within the organization, while also safeguarding waste management initiatives from existing problems such as corruption. It is important to note that Bombay, Mumbai under British rule, had created one of the best sewage management systems in the country. And it is imperative that the authorities of Mumbai realize that changing the name of the city will not reduce its stink. Mumbai, by any other name, will stink the same. Only more in the years to come. Have elections become the poison of today’s democracy? Applying the rules of the market to education: Does it pass the test? Soul Attraction— Destiny or Free Will? And the world moves on ……. Why do you sit on an elevated golden throne, Master?